About Rainbow Ryders Hot Air Balloon Ride Co.
About the Colorado Springs Sports Corp.
COLORADO SPRINGS, Colo. — If you’re looking for something to do over the long Labor Day weekend in southern Colorado, we’ve got you covered. This weekend is the annual Labor Day Lift Off at Memorial Park in Colorado Springs. Keep your eyes on the sky as more than 70 hot air balloons ascend at 7 a.m. Saturday, Sunday, and Monday. The event is free to the public and features live entertainment, demonstrations by the USAFA Wings of Blue skydive jumpers, a chainsaw carving competition, and much more. Visit labordayliftoff.com for a full schedule. Thousands of spectators were treated to a delightful view from Memorial Park on Saturday morning as nearly 70 hot air balloons dotted the Colorado Springs skies. Thanks to calm weather conditions, the Labor Day Lift Off went without a hitch, organizers said. The first balloon floated in the air about 7 a.m., and the last one took off an hour later. The balloons traveled miles southward to a landing area. This year, 66 hot air balloons from 12 states — including Colorado, Utah, Texas, New Mexico, California and Arizona — were scheduled to take off throughout the weekend. On Saturday, event organizer Scott Appelman said, one balloon stayed on the ground because of a tear in it. Otherwise, organizers couldn’t have asked for better conditions to kick off the three-day event. “It was perfect hot air balloon weather,” Appelman said. Spectators watched balloons shaped like a football, a rocket ship, a soccer ball and cartoon characters go up, up and away over and over again. A big crowd formed around a balloon depicting the nursery rhyme “There was an Old Woman Who Lived in a Shoe” before it took off. Micah Marshall, 7, wanted see a Star Wars-themed balloon but didn’t find one. Nonetheless, he was happy that he got up early for the event. “There’s a lot of fun balloons,” he said. Laura Nunez and her three young sons have been attending the Lift Off for the past few years. The boys couldn’t stop talking about the event all week, the mother said. The free event boasts more than just hot air balloons. This year, it also features a donut-eating contest, a chainsaw carving demonstration, live music, food and a show by the USAFA Wings of Blue Skydivers. The popular Balloon Glow is 7:30 p.m. Saturday and Sunday. The balloons will take off again 7 a.m.Sunday and Monday. A 40-year tradition of hot air balloons launching from Colorado Springs on Labor Day weekend will continue this year, organizers announced Monday. The Colorado Springs Labor Day Lift Off will be from Sept. 3-5 and will celebrate the 40th year the balloons have launched from Memorial Park. An estimated 150,000 people attended to watch 65 hot air balloons launch last year. The news of another liftoff shows stability for an event that was once threatened after leaders for the Colorado Balloon Classic – which previously organized the event – announced it would not return in 2015. Another organization, the Colorado Springs Labor Day Lift Off, run by event organizer Hot Apple Productions, stepped in last year to run the event. The group will be hosting the event again this year and expect to have 70 balloons participating. 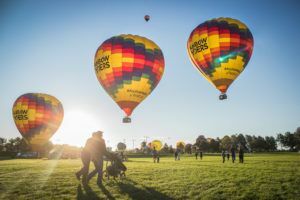 Along with the traditional balloon launch and balloon glow, new events this year include skydiving demonstrations, wakeboarding exhibitions, paddle boarding and a beer garden. The event will include the balloon launches at 7 a.m. each day. On Sept. 3 and Sept. 4, the event will host balloon glows, where the burners are turned on and the balloons inflate by their light. Balloon rides are available by calling Rainbow Ryders Hot Air Balloon Ride Company at 800-752-2477. After landing, riders will be given a lift back to the park. Get your lightsabers ready. Darth Vader and Yoda are coming to Colorado Springs. 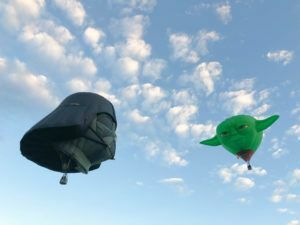 Attendees of the Sept. 5-7 Colorado Springs Labor Day Lift Off will have a chance to see the two Star Wars characters among about 75 other special and regularly shaped hot air balloons at Memorial Park, said event organizer Scott Appelman. 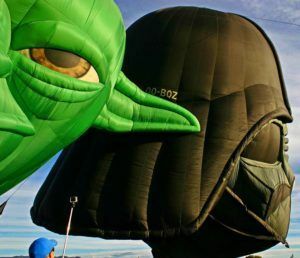 41 photos Photo – Yoda and Darth Vader balloons are filled prior to liftoff at the Balloon Fiesta in Albuquerque in 2014. The ‘Star Wars’ themed balloons are expected to be at the Colorado Springs Labor Day Lift Off, which will be held Sept. 5-7 at Memorial Park. Photo via tripadvisor.com. The Labor Day weekend tradition will also feature concerts by Suga Bear and the Showtime Band on Saturday and Sunday, wakeboarding exhibitions on Prospect Lake and a beer garden among other changes. “We’re just trying to bring a new flavor to things,” Appelman said. The additions come after uncertainty hung over the event in 2014. On Aug. 15, the organization behind the Colorado Balloon Classic, the Labor Day Lift Off’s former namesake, announced it would not return to Colorado Springs. Two weeks later, the Balloon Classic completed its 38th festival in the city, and officials sent out hundreds of requests for proposals to find a replacement event. City officials selected Appelman’s proposal earlier this year. It was the only event plan that included hot air balloons, officials said. 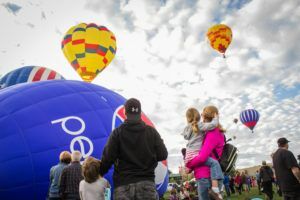 With unfavorable weather always a threat to ground the hot air balloons, Appelman hopes the wider array of concession and entertainment options will keep people at the park. The event is free and open to the public. COLORADO SPRINGS, Colo., June 22, 2015 (GLOBE NEWSWIRE) — Hot Apple Productions, in affiliation with Rainbow Ryders Hot Air Balloon Ride Co., the largest hot air ballooning company in the U.S., announced its balloon lineup for the 39th Annual Colorado Springs Labor Day Lift Off, which features Darth Vader and Yoda along with seven other special shapes and 75 hot air balloons total. Additionally, the event will have a beer garden and VIP tent, live entertainment and concerts on the big stage and a weekend full of lake activities including wake boarding exhibitions, paddle boarding and other activities at Prospect Lake at Memorial Park in Colorado Springs. 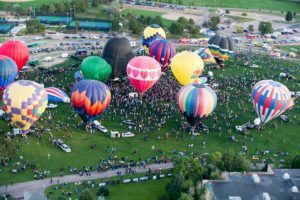 The free event (one of only two in the U.S. that is free) is one of one of the largest hot air ballooning events in the nation and the largest in Colorado. For more information on the event or sponsorship, go to www.coloradospringslabordayliftoff.com or call 719-219-3333. Rainbow Ryders, Inc. Hot Air Balloon Ride Co. in business for 31 years, is the largest commercial hot air balloon operator in the United States with offices in Phoenix and Albuquerque. Rainbow Ryders’ pilots have flown in 45 states and managed events in Chihuahua and Guadalajara, Mexico and have over 180 years combined experience. To date, Rainbow Ryders have flown over 220,000 passengers. In addition to producing the Colorado Springs Labor Day Liftoff, Rainbow Ryders Hot Air Balloon Ride Co. is also the official hot air balloon ride vendor of the Albuquerque International Balloon Fiesta, the world’s largest hot air balloon festival. T-minus 198 days to launch. With a name and a website, Colorado Springs’ new balloon festival is preparing for its September debut. More than 250 names were suggested for the event, and the winner is: The Colorado Springs Labor Day Lift Off. 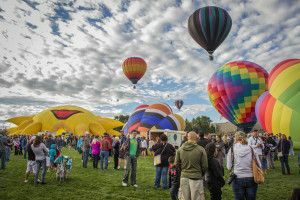 Appelman delighted residents by keeping a Labor Day holiday balloon event in the city after the organization behind the Colorado Balloon Classic announced last year that 2014 would be its last in Colorado Springs after 38 years. The city in September sought proposals for a new event and five organizers submitted plans. Only Appelman, a respected name in the industry and owner of a Albuquerque-based commercial balloon company, had a proposal that included hot air balloons. Appelman asked residents to suggest names and received an outpouring of ideas. A committee filtered through the submissions sent by Facebook users over a two-week period before picking one. It was announced Tuesday on Facebook along with information on the website for the festival. Stacy Wallick-Rawlins, the winning submitter, won a balloon ride for two on the first day of the event scheduled for Sept. 5-7. Appelman said he has a lot of work ahead of him in organizing sponsors, recruiting balloon pilots and bringing other entertainment opportunities to the festival, but he was happy the naming process was so popular with residents. 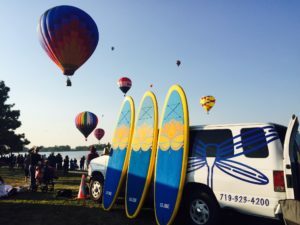 A wakeboarding exhibition, beer garden and a food truck competition could join hot air balloons at Memorial Park this Labor Day weekend. Scott Appelman, organizer of the inaugural Colorado Springs Labor Day Lift Off, said those attractions and others are being considered as part of the new version of the festival to be held Sept. 5-7. Appelman pitched the ideas at a meeting Wednesday to about four dozen potential sponsors for the festival set to replace the Colorado Balloon Classic, which celebrated its 38th event in the city last year. On Aug. 15, the organization behind the Balloon Classic announced the 2014 Labor Day festival would be its last in Colorado Springs. Appelman’s Hot Apple Productions company was selected to replace the Balloon Classic in January, after a request for proposal process that included five applications. Appelman’s was the only plan that included hot air balloons. Hot Apple Productions announced last week that it is partnering with the nonprofit Colorado Springs Sports Corp. to help with the planning effort, and Wednesday was the first formal opportunity to showcase their partnership. Tom Osborne, president and CEO of Sports Corp., said his organization would help Appelman connect with sponsors and with event logistics. “We’re thrilled to be a part of it,” Osborne said. 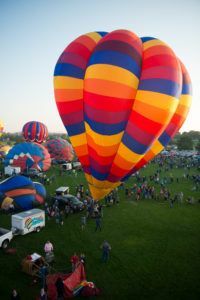 Appelman said that in addition to bringing in new entertainment opportunities and amenities to the event, he expects close to 75 hot air balloons to participate and there will be balloon glows for the festival’s Saturday and Sunday evening schedules. “We’re going to ramp this up a bit,” he said. Click here to read more at the Gazette.com. Find additional news coverage here at KRDO.com. To learn more about the event , register or to volunteer, please visit:www.coloradospringslabordayliftoff.com. Rainbow Ryders Hot Air Balloon Ride Co. has been in business for 31 years, and is the largest commercial hot air balloon operator in the United States, with offices in Phoenix and Albuquerque. Rainbow Ryders’ pilots have flown in 45 states and managed events in Chihuahua and Guadalajara, Mexico and have over 180 years combined experience. To date, Rainbow Ryders have flown over 220,000 passengers. In addition to producing the Colorado Springs Labor Day Lift Off, Rainbow Ryders Hot Air Balloon Ride Co. is also the official hot air balloon ride vendor of the Albuquerque International Balloon Fiesta, the world’s largest hot air balloon festival. Colorado Springs Sports Corporation (The Sports Corp) is a 501(c)3 non-profit committed to establishing a strong regional presence through positive economic development and contribution to the quality of life for citizens in the Pikes Peak Region. The Sports Corp was established in 1978 to assist in the relocation of the United States Olympic Committee from New York City to Colorado Springs and has grown and prospered to become a driving force in the agenda for amateur and Olympic sport. Through event promotion and community development activities, The Sports Corp plays a critical role in bringing city and civic leaders together with some of the nation’s premier sporting organizations, including the United States Olympic Committee and national and international sports organizations. As a professional event management company, The Sports Corp spearheaded the organization and management of the following events, driving economic vitality in the Pikes Peak Region: the Rocky Mountain State Games, State Games of America, The Broadmoor Pikes Peak International Hill Climb, The Broadmoor Pikes Peak Cycling Hill Climb, NORCECA Men’s & Women’s Volleyball World Championship Qualifier, Warrior Games, USGA Senior Open, U.S. Women’s Open, USA Pro Challenge, USA Boxing National Championships, and many other high profile events. Colorado Springs, CO – March 10, 2015 – Hot Apple Productions, in affiliation with Rainbow Ryders Hot Air Balloon Ride Co., the country’s largest hot air ballooning company, announces its partnership with the Colorado Springs Sports Corp. to produce the Colorado Springs Labor Day Lift Off hot air balloon rally – www.coloradospringslabordayliftoff.com. Joining the team is Brianna Goodwin, who will work not only with the Colorado Springs Labor Day Liftoff event but other key events for the Colorado Springs Sports Corp. Prior to joining the Colorado Springs Sports Corp. Brianna was the Special Event Coordinator for the City of Colorado Springs. The public is invited to a Meet the Team event at 4:30 p.m. on Wednesday, March 25 at the Hotel Elegante, 2886 S. Circle Drive. There will be information for sponsors, vendors, concessionaires and suppliers. Balloon pilots, crew and volunteers are invited to attend a presentation at 6:30 p.m.
About Colorado Springs Sports Corp. The Colorado Springs Sports Corporation, is a 501(c)3 corporation that was created in 1978 as the United States Olympic Committee relocated from New York City to Colorado Springs and staged its inaugural National Sports Festival, and later the Olympic Sports Festival, at the foot of Pikes Peak. Since then, “The Sports Corp” has grown and prospered over three decades to become a driving force in the agenda for amateur and Olympic sport. The Sports Corp plays a strong role in bringing city and civic leaders together with some of the nation’s premier sporting organizations and events which include but are not limited to: the United States Olympic Committee, national and international sports organizations, the Rocky Mountain State Games, State Games of America, Pikes Peak International Hill Climb, Warrior Games, USGA Senior Open, U.S. Women’s Open, Australian Rules Football U.S. National Championship, USA Pro Challenge, USA Triathlon Youth & Junior National Championships, U.S. Women’s National Ice Hockey Qwest Tour and many other high profile events. Colorado Springs, CO – February 17, 2015 – Hot Apple Productions, in affiliation with Rainbow Ryders Hot Air Balloon Ride Co., the largest hot air ballooning company in the U.S., has launched a website for the Colorado Springs Labor Day Lift Off hot air balloon rally – www.coloradospringslabordayliftoff.com. The name was selected after a citywide contest, which was won by Stacey Wallick Rawlins. 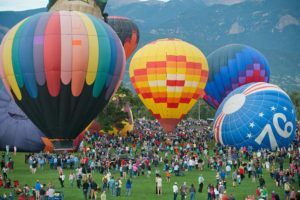 For submitting the winning name, Rawlins won a balloon ride for two on the opening day of the event, which will be held September 4 – 7 at Colorado Springs’ Memorial Park. The event will feature up to 75 hot air balloons including special shape balloons, opportunities for people to fly during the mass ascensions, live entertainment including bands and dance troupes, a children’s play area and vendors/concessionaires. The event, now in its 39th year, is one of the top 10 largest hot air ballooning events in the country. Long-time Colorado Springs balloonist David Bair will serve as Balloon Meister. He is a 26-year ballooning veteran, with over 20 years flying this event and throughout Colorado Springs. The website has applications for pilot sign-up, sponsorship info, vendor and concession applications and volunteer sign up. People can also sign up for an electronic newsletter to be kept abreast of all the events, specials and news.